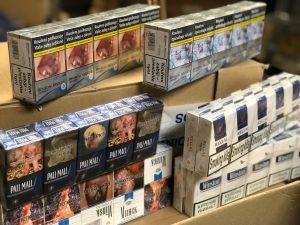 Counterfeit cigarettes worth more than £40,000 have been seized following a raid by Sefton Council’s Trading Standards team and Merseyside Police. Officers acted on information from the public which identified a residential premise in Southport Town Centre being used to store illicit tobacco for a nearby retail unit. 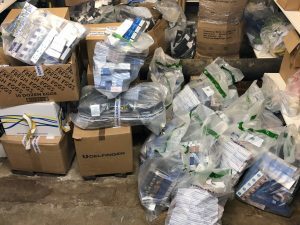 More than 200,000 illegal cigarettes were seized after both premises were visited by Trading Standards officers and specially trained tobacco sniffer dogs. The seizure included counterfeit and non-duty paid products which cannot be legally sold in the UK. Cllr Paulette Lappin, Sefton Council’s Cabinet Member for Regulatory, Compliance and Corporate Services, said: “This incredible discovery would not have been possible without the hard work of our Trading Standards team and partners in Merseyside Police. “We hope this seizure serves as a stark warning to others that we will always take action against anybody who chooses to trade in illegal tobacco. “Sales of illicit tobacco is completely unfair on those traders who sell UK tobacco products legitimately. “The availability of cheap illegal cigarettes like this needs to stop and we are determined to protect legitimate traders, consumers and the general public. Community Policing Sergeant, Andy Dentith said: “A concerted effort between Merseyside Police and our partners at Sefton Council’s Trading Standards team has led to this fantastic result and a large quantity of illegal and potentially dangerous cigarettes will now thankfully not reach the public. ” Any breaches of licenses or criminal offences that we find will be dealt with robustly. Our message is simple: we will visit, search and prosecute any businesses which put the health and safety of the community at risk. “The recovery of more than 200,000 cigarettes will have significantly disrupted the activities of those involved and we ask anyone with any information about suspected illegal activity in the area to contact us. Anyone who does suspect the sale of counterfeit products or any form of fraud should contact Citizens Advice Consumer Helpline on 03454 04 05 06 or Crimestoppers on 0800 555 111.